This will not be a standard review since this was not a restaurant experience, but I will strive to stick to the format. A representative from Omaha Steaks recently contacted me to see if I would review their burgers. I jumped at the chance. 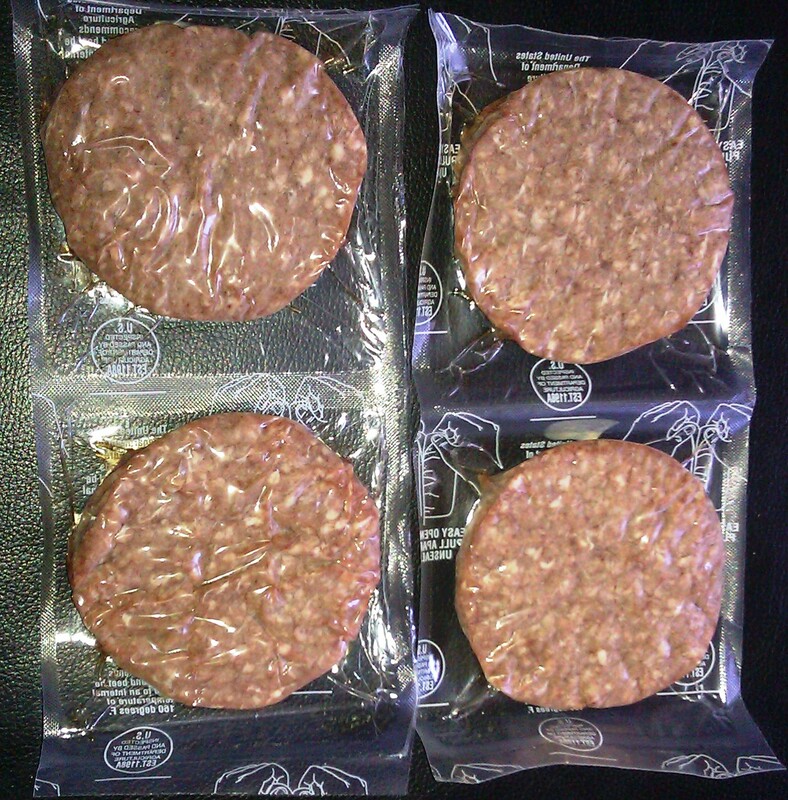 Omaha Steaks graciously offered to send out a box of assorted meats, including 4 of their 4-ounce burgers. I was delighted to take them up on this offer. I you have never taken delivery of a box from Omaha Steaks, then you have not lived, brother. The shipment arrived in a thick, styrofoam cooler. The assorted meats were sealed in blister packs, boxed, and it were kept frozen with a sizable chunk of dry ice. The dry ice, naturally, was dropped (using tongs) into the toilet to turn Happy Meal's bathroom into a pre-Halloween haunted lavatory..you probably shouldn't do this. It was pretty cool, though. The Beef: For this review, Omaha Steaks provided their standard, 4-ounce burgers. I assumed that the burger meat was Chuck. The beef was really quite flavorful, and that was surprising for a frozen product. The burger meat was beefy with notes of iron, funk, and minerals. It was nearly on par with the Niman Ranch beef that we had previously enjoyed at Super Duper in San Francisco, CA. The fat content was high, but much of that fat rendered off during the cooking process. I estimated that the fat netted out to about 20%. The beef was also very juicy. It must have been flash frozen, because the juices didn't leak out of the meat as it cooked. Beyond that, the bite was tender. Solid beef! The Seasoning: I applied a 1:1 mixture (by volume) of kosher salt flakes and ground pepper. This was all that the beef required to amplify its well-balanced flavors. The Sear: The sear was crisp and dark. It could have been a little deeper, but I was cooking in an apartment, and I didn't want to set off the smoke alarm. The salt and pepper combined nicely with the seared burger meat. The Preparation: The coarsely ground beef arrived in pre-formed patties. The bite was tender enough to indicate that Omaha Steaks knew what they were doing when it came to burgers. 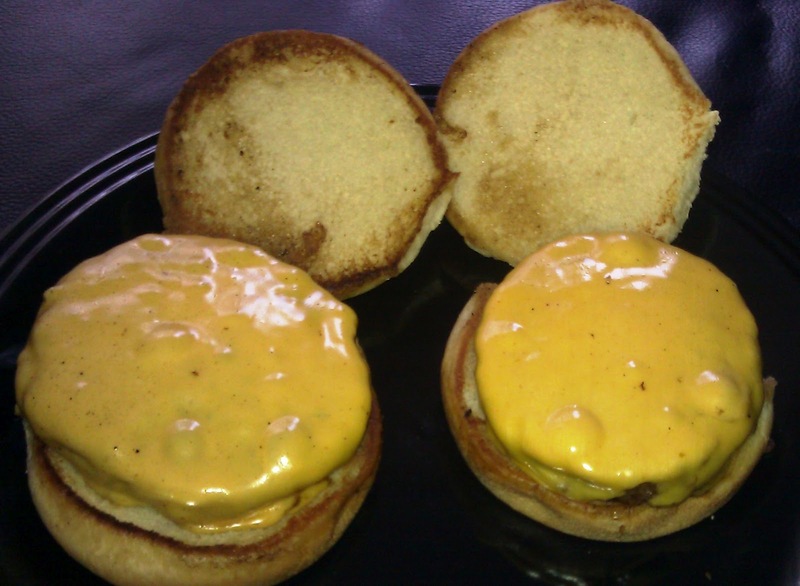 I started the burgers in a toaster oven, which was set to broil at a temperature of 450 degrees. I let them cook for about 5 minutes to bring them up to Med-Rare. From there I transferred them to a cast-iron pan, which I had coated with peanut oil and brought up to the smoke point (also 450 degrees) over a gas flame. I let the burgers cook for about one minute on each side. The burgers came out to moist Medium. The Cheese: I used standard American Cheese from Costco. The trick to melting cheese without over-cooking the burgers was to wait until the burgers had 30 seconds to go...apply the cheese slices...cover the pan with a lid...wait thirty seconds for the cheese to melt in the rapidly developing steam...uncover for 10 seconds...transfer to waiting, toasted bun. The cheese was perfectly melted and just right for the juicy burgers. 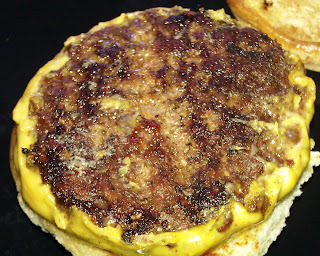 The Bun: Due to the small size of the Omaha Steaks burgers, I had limited choices in terms of burger buns. I went with small burger buns from Safeway Kitchens. These were fresh, sweet, a little yeasty, and they toasted up nicely. The Meat To Bun Ratio: The small bun was a perfect match for the 4-ounce burgers. Value: At the time of this review, one could order 12 of these burger patties for $19.99 (plus shipping). That was about $1.67/for each burger patty, and that was a really good value. Burger Review : Omaha Steaks provided a high-quality burger patty for a really good price. If you have some moderate kitchen skills, then this is a great burger to have on standby to impress you friends with. Happy Meal and The Marinater were both pleased. Rating...4 Bites (Omaha Steaks also makes a higher end burger patty, which may rank even higher. i'm sorry pete. i have to disagree with you on this one. omaha burgers are DISGUSTING. i always seem to get grisle in them and i dont like the taste. they DO shrink horribly when thye're cooked, almost down to the size of a quarter. their sales promotions are all gimmick and they try their darndest to 'pull the wool over your eyes' with their bombardment of emails. and, have you tried their HOT DOGS? they are absolutely horrendous! disgusting! fake, artificial pink colored, tasteless filler. but then, this all only my opinion. i still check your site daily and follow your journey around so cal eating burgers. how have you been? any word on the show? is the show still coming? take care. I cant say nothing but good about about my dealing,s with Omaha steak,s,!!!!! I wonder if the burgers have changed recently. I did make two attempts to get it right. On the first try, I used buns that were too large, and I didn't cook the burgers on a hot enough surface, and I under-seasoned them. On the first attempt,I came up with average results. The key was searing the heck out of them. I haven't tried the hot dogs--those are still in the freezer. I am not big of hot dogs. I did try the Top Sirloins...again just salt and pepper seared in peanut oil on cast iron. The steaks were thin, so they ended up Medium. Still, my youngster, Happy Meal, and I found them to be juicy and flavorful. The same went for the Filet Mignon. This was easier to get to Med-Rare due to the increased thickness. I was dubious about the chicken breast, because I thought they looked a little small. I braised that with garlic, soy, sesame oil, rice vinegar, and a little pepper. The breasts did not shrink, and they were surprisingly juicy. I have always been wary of frozen products, because the ice crystals tend to pierce the cell membranes,and this causes leakage upon defrosting. That, in turn, leads to rubbery, dry food. This was not the case here, and that was refreshing. We are still shopping the show, but that is slow going. I hear that's normal. Otherwise, trying to stay fit. Running the Santa Monica Stairs later on today. Trying to get my time down to 30 seconds. I can't seem to break 31. Best to you, Pablo. I really appreciate hearing from you. Have you tried Pier Burger yet? That was a heck of a burger and a great price. I hear the shakes are amazing. The portion size is a great thing about Omaha Steaks. Especially if your trying to keep your calories under 1500. Great to have the burgers, chicken, pork and the like around to put together a quick meal. I have to say that I do not like these burgers. They are very fatty and are just swimming in grease when they cook. If you are looking for a healthy choice in a burger, this would not be it. They also have little bits of grisly fat that you bite on every so often. I am quite surprised that many people like them. Oh well...all tastes are different. Had 2 Omaha burgers last night, Pete's evaluation is spot on! Flavorful and juicy. Yes their pricey but in my opinion you get what you pay for! Oh yeah I can slice their filets with a fork! Pablo, size of a quarter? What are you s.....g? Pete's take is spot on. Had 2 Omaha burgers just last night, flavorful and juicy. Just seasoned with kosher salt, pepper and garlic powder. Found if you pour a little extra virgin olive oil in pan first, heat in up and then throw in your seasoned burgers and prepare to desired doneness the oil gives the burgers a nice crispy outer crust while remaining juicy and flavorful inside. Pablo should just purchase his burger from his local market, sounds like he's use to pink slime and fillers in his meat. I think Pablo had a bit of bad luck. Hank, recently I've moved to salted butter. I have found that it work really nicely with beef in terms of searing. did not put oil in the skillet, as I thought they might be tastles and they were.. I would NOT recommend these to anyone including my worst enemy. I beg to differ. You can get fresh ground beef from your grocery store and pre-form them. And they taste better than anything you get online frozen. 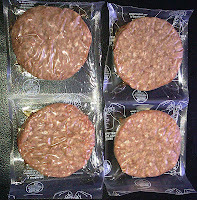 Why would someone buy frozen hamburgers, it beats the heck out of me, lol. I've has Swans, Kansas City Steaks, and Omaha Steaks, and the best meat for hamburgers is fresh ground chuck from Wallmart, lol. It's really cheap too. While you're at it, try a fresh steak at Wallmart too, lol. I buy huge porter house steaks from Wallmart, and I have the butcher cut them in half. I get a nice filet mignon and a nice strip steak from 1 porterhouse, lol. And guess what suckers, no shipping costs and it's a lot more fresh, lmfao. Try mixing half buffalo meat and beef to form a burger patty. It's the best burger I've ever had on the grill. Salt and peeper lightly brushed with oilive oil, oh my. I also really enjoy Omaha steaks. They can be pricey but you can catch some really good deals on free shipping and Groupon offers that can lower the price.